Paul Knoepfler has posted a two-part interview with Jeremy Berg that should be of considerable interest to those who wander by MWEG. In Part I, Jeremy offers advice to grant applicants (“Submit the most carefully prepared applications that you can!”) and reflects on how applications are selected for funding (including the accompanying budget cuts). In Part II, Jeremy provides his perspective on NIH funding in the next 5 years (anywhere from tough to horrible, depending on what happens with sequestration), what he would use his magic wand to change (give feedback to reviewers), and what he learned as NIGMS Director (the good, the bad, & the ugly). Thanks to Paul for taking the time and initiative to do this (in his vast spare time) and to Jeremy for sharing his insights with the research community! Last week, the NIH announced pilot program in which IC Councils will conduct an extra review of competitively scored applications from PIs who currently receive $1.5M or more per year in total costs to determine if additional funds should be awarded (this roughly matches the long-standing NIGMS strategy of giving extra scrutiny to PIs receiving $750K or more in direct costs, assuming an average F&A rate of ~50%). The NIH is quick to note that this Special Council Review (SCR) does not represent a funding cap policy and that “some of the most productive investigators are leading significant research teams and programs that may require over $1.5 million/year of NIH awards to be sustained … [and] that some types of research, for example large complex clinical trials, may commonly trigger this review but may also be recommended for funding.” RFAs and big P program applications won’t receive extra review, and with multiple PI/PD submissions, each of the PIs would need to exceed the $1.5M threshold. This pilot effort was inspired by the discussion on how the NIH can best manage its limited resources … the interactive slide on RPG funding per PI indicates that 6% of PIs receive $1.5M or more per year, representing 28% of the RPG budget. This week, Science reported on the Big Pitch experiment at the NSF (Molecular and Cellular Biosciences Division) in which two different review panels reviewed two different presentations of the same research. One panel received the full traditional proposals, while the other assessed anonymous 2-page summaries that focused on the underlying concept rather than experimental detail. Only 3 out of 55 proposals (in this pilot, on climate change) were rated highly by both review groups, and 2 of these were funded; altogether, the NSF funded 3 projects selected exclusively through the 2-p proposal and 5 through the full proposal reviews. Shirley Taylor, an awardee during the evolution round of the Big Pitch, says a comparison of the reviews she got on the two versions of her proposal convinced her that anonymity had worked in her favor. An associate professor of microbiology at Virginia Commonwealth University in Richmond, Taylor had failed twice to win funding from the National Institutes of Health to study the role of an enzyme in modifying mitochondrial DNA. A second round of Big Pitch (evolution proposals) had similar results, and the NSF is considering adding another arm to the experiment in which a third panel of reviewers receive both the short proposal and an abbreviated biosketch of the PI. They might also consider 4 rather than 2 pages for the concept proposal … and, apart from the anonymous review experiment, the MCB Division has limited the number of proposals a PI can submit, while Integrative Organismal Systems and Environmental Biology have implemented a pre-proposal policy (with submission of full proposals invited). Small steps to address perceived inequity in funding decisions … looking forward to even more innovative, paradigm-shifting proposals. This time by Sally Rockey on Rock Talk. Jeremy Berg introduced the concept of correlating overall impact score with the individual criterion scores, first using NIGMS and then NIH-wide data. Based on the 32,546 applications (of 54,727 submitted) that received overall impact scores in FY10, OER played with the numbers a bit more but came up with the same conclusions: Approach and then Significance drive Overall Impact scores. For applications receiving numerical impact scores (about 60% of the total), we used multiple regression to create a descriptive model to predict impact scores using the applications’ criterion scores, while attempting to control for ten different “institutional” factors (e.g., whether the application was new, a renewal, or a resubmission). 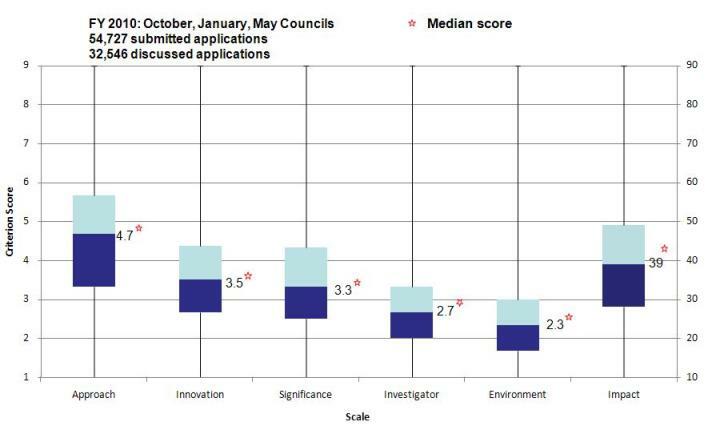 In the model, scores for the approach criterion had the largest regression weight, followed by criterion scores for significance, innovation, investigator, and environment. The same pattern of results was observed across multiple rounds of peer review and institute funding decisions. She also notes, as can be seen in her figure, that scores for Approach showed the widest range, followed by Significance. So, the work you propose doing better be important … and, more importantly, better be done right.